As I was roaming around the WordPress neighborhood yesterday, my Sunny Side Up neighbor, Lori Franks, had an interesting post: To Tattoo or Not to Tattoo . . .? It’s her “public service announcement” letting us know her intentions of getting some art work done in the near future. She hopes to post the design(s) she selects, and I am waiting with great anticipation. I’m sure it will be lovely. Body ink artwork is very popular today, and although I enjoy watching talented tattoo artists at work, creating their intricate and unique designs, my heart finds peace in nose piercings. Culturally, in America, ear piercings have been more acceptable and a common ritual since its early start during the early 60’s and 70’s, than nose piercings . Girls get their ears pierced just as early and without much thought as routine circumcisions are done to our sons soon after the hospital delivery. Hey, here’s a thought . 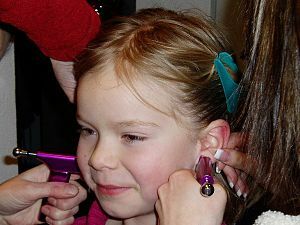 . . have your daughter’s ears pierced right at the hospital. Maternity suites can offer an optional service for a small fee. Oops, maybe they do offer the service these days, I wonder. But on the rise here in my small town, are the nose piercings. I go to the bank and just about every bank teller is flashing a discreet nose ring. From cashiers, waitresses and heavens, I almost forgot to include myself!! Yes, the story is true. Early last year, I dragged accompanied my dearest friend to our local tattoo/body piercing art shop and we quietly had our noses pierced. Well, I was quiet but my friend, bless her heart, went first, but as she waited while my nose got pierced, she suddenly fainted and caused lots of noise. And she also caused the pierce artist to go into fright for he thought she hit her head on his tattoo chair. She didn’t. Everything was fine. My friend quickly got up and after a drink of water, felt like nothing out of the ordinary just happened. Today, I prefer the dainty and discreet nose rings while my friend alternates between the little hoops or nose ring designs like the smiley face or the peace sign! In India, nose rings are part of the culture and I am happy both tattoos and nose rings are becoming a normal part of our culture today. Of course, as with anything, moderation is the key . . .
Wordless Wednesday: Close your Eyes!! I’m thinking the lady with all the bling must have a high status in her culture. I read in some places, the more power you have, you show it with facial jewelry. Wow! That’s a whole lot of power, lady! I’m laughing to much now . . . gotta go! Bye! Thanks! Moderation is the key! Hilarious! Plastic surgeons love this trend – patching things up keeps them busy! A fun story about body art. I do find it interesting what any given society will “accept” when it comes to body art. In many ways it’s ridiculous, but that can be said about many customs within a given society. But as you imply, whatever is acceptable is also changing with time. Just a precaution though, it might not be very wise to pierce a child right after delivery, it might actually increase intolerance later on towards metals – even with pure metals. but I think in some cultures ears are pierced very early in life. I visited Tanzania in Africa for a few weeks, and when we went to visit some of the local tribes, they were shocked to see my nose ring (a septum piercing, so, in the middle, not the side). The wanted to know if it really went through my flesh and why I would do something that ridiculous and painful. I didn’t speak Swahili but I could hear my brother telling them over and over again, simply “My sister is crazy.” Thanks a lot, bro! They were all very sweet, and they had a good laugh at me, but I thought it was pretty funny that people with their upper ears stretched to the size of quarters, or scarification patterns circling their eyes, were so confused by a piercing through the center of my nose. 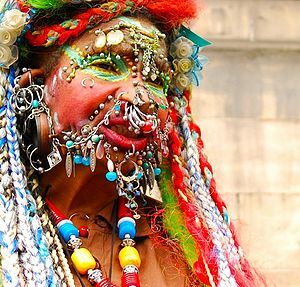 A first-hand taste of what you say in your lovely post – how much culture dictates what piercings we find odd! Ouch! The upper ears stretched to the size of quarters and scarifications sounds like very painful facial rituals. Not very painful at all! Ticklish for me. There’s a sweet spot of flesh below where the cartilage starts, so it’s just like getting your ear pierced! Wow, I didn’t know about the sweet spot. Hmmn, interesting. Amazing some intricate tattoo designs and how the person managed to sit for the procedure is just as amazing! That last pic is more than freaking me out. The last picture MIGHT be taking it too far! What? You don’t think the bling woman is drop dead gorgeous?? I’d expect the person in that last pic to fall flat on his or her face from all the weight. Like I told mj, the woman is DROP dead gorgeous! Ya think? How does she sleep comfortably at night? Thanks for the pingback. 🙂 When I got my eyebrow pierced I contemplated my nose but thought it might bug me and I would feel the need to pick at my nose all the time! Eeekk! I am excited and can’t wait to preview your design(s)!